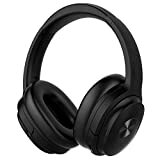 What do you look for when you are shopping for a pair of headphones? Well, I can’t speak for everyone but my checklist consists of four things- comfort, sound quality, design and last but not the least, value for money. Now, when you are specifically looking into noise-canceling headphones, you sometimes have to settle for a gear that sounds subpar. After a hell lot of trials and tribulations, I finally found a noise-canceling headphone that ticks all the boxes. And most of all, I don’t have to settle for poor sound quality at the cost of noise cancelation. I’m talking about Cowin SE7 which is touted by many as one of the most comfortable and neatly crafted products by Cowin so far. Cowin E7 comes the closest in competition to SE7. Both have great designs, excellent sound quality, good playback time and ANC. But when it solely comes to comfort and overall performance, Cowin E7 and SE7 share a few notable differences. Protein foam on earpads. The underside of the headband is also well-cushioned. 30+ hours of battery life. Apt-x technology that reduces compression to enhance sound output. The design of SE7 screams of quality. It’s big but not heavy at all. The memory protein foam on the earcups gently wraps your ears. You can wear it for as long as you want without feeling uncomfortable. This is especially useful for people like me who wear glasses. The headband looks plush, is adequately padded and easily adjustable to the diameter of your head. However, I won’t recommend it for wearing during jogging or heavy workout because it will slip. Moreover, even though the earcup material is super soft, it may produce heat and sweating during an intense workout. Moving on, despite being made from plastic, Cowin SE7 has an upmarket vibe to it. It has published in two color schemes- black and gold. The black version is as good as it gets but the gold model looks absolutely wow! The stylish logo of Cowin is printed on the right earcup and all the controls are located on the rim. It comes in a solid carry bag and folds easily for easy traveling. With a simple flick of a switch, you can switch on or off the active noise cancelation. Then there are the usual On/Off, play/pause track, receive/reject phone calls buttons. There’s an LED light indicator which lights up when the ANC is on. Another small but significant addition is that the headphone gives you incoming call alerts too. SE7’s sound can be best described as bass-driven. More bass means more thump and more thump means more fun for most listeners. The bass is deep, powerful but in no way, too bright combined with crisp vocals. The separation of mids and high-mids from the bass is excellent in these headphones. Cowin SE7 sounds the best when the NC is off. But when you switch it on, the bass starts sounding a bit flat. However, I don’t mind much because who needs NC when I can just turn up the volume to cut the ambient noise? I know I’m smart, thanks! Moving on, it uses AptX technology which is basically a Bluetooth audio streaming codec, best suited for Android phones. It aids low latency, lower than almost 250 ms, which is quite a lot at this price-point. Low latency simply means the amount of time between sending the audio via Bluetooth and hearing it on your device is reduced. While latency hardly matters while listening to music, you’ll understand the importance of it while watching videos. Have you ever noticed that the audio doesn’t sync properly with the video? I’m sure you have. We all hate it. That is won’t happen with SE7, thanks to the AptX tech. The noise cancelation of SE7 isn’t something worth going crazy about. It works just fine. If you put it on while walking on a busy road, you won’t be able to hear your friends saying “Hello!”. It will also effectively dampen engine noise and cacophony of city traffic. It should give you peace of mind while traveling in a red-eye flight. However, as I already said before, turning on NC does push the bass back to some extent. It won’t sound pathetic but if you want better sound quality, just crank up the volume to isolate external noise. Easy-peasy, eh? It uses the latest BT 5.0 which provides super fast connectivity with BT-enabled devices and has a great coverage range too, up to 300 feet. Thanks to AptX technology, there’s minimal latency and therefore, it is a great headphone for Skype calls, watching videos and playing games. Although Cowin advertises a whopping battery life 30+ hours, so far, I’ve only seen it last for about 20+ hours with ANC on and max volume settings. Well, even 20+ hours is quite a lot on max settings when you are traveling by flight or just taking a ride to college. The package includes a semi-hard carrying case along with an airline adapter for those who fly frequently. The casing has ample of room, so you can fold the headphone with wire as well. Among the usuals, you will find 3.5 mm jack for wireless playback and USB cable for charging. Effective filtering for traffic noise. Sound output when the NC is on. Honestly, the ANC power could be improved. SE7 is one of the most comfortable headphones, clearly beating even many of its costlier counterparts by a huge margin. It has a really sleek design and portable enough to fit in your backpack. It has great battery life and boy! The music packs a hell lot of thump. If you are a fan of EDM and Metal, you’re in for a treat. The NC works fairly well. Although it won’t block the sound of your cat singing jazz or the humdrum of city life, it will isolate enough ambient sound to help you concentrate on your book. If I have to solely talk about the audio quality and NC, I would say SE7 is almost, if not fully, on par with SE8, Sennheiser HD280 Pro and even Audio Technica ATH-M40x.